Change a Child’s Life, Heal a Family, Impact a Community! Working at Boys Town is not just a job, it’s an opportunity to use your unique skills and talents to bring life changing care to children and families throughout the country! As one of the nation’s largest non-profit organizations, Boys Town touches the lives of more than 2 million people each year. So whether your interests lie in Marketing, Information Technology, Social Work, Criminal Justice or Education, you can make a positive impact today! Revive! Omaha Magazine is a publication of SMBEnterprises, LLC and is distributed via mail and selected locations throughout the Greater Omaha area and beyond. ©2013 SMB Enterprises, LLC. All rights reserved. Reproduction in any form, in whole or in part, without express written permission from the Publisher, is prohibited, excepting individually copyrighted articles or photographs. The views expressed herein, whether expressed as fact, fiction, opinion, advice or otherwise, are those of the authors and do not necessarily reflect those of the ownership or management of SMB Enterprises or Revive! Omaha Magazine. Manuscripts and photographs submitted for publication are welcome and should be accompanied by a stamped, self-addressed envelope if their return is desired. We reserve the right to edit, use, or not use materials submitted. The publisher assumes no responsibility for return of unsolicited materials. The publication of any advertisement in this issue does not constitute an endorsement of the advertiser’s products or services. National Coalition of 100 Black Woman presents… 6th Annual Women of Color in Leadership Summit and Legacy Awards Luncheon Creighton University- Harper Center Summit 8:00 am-4:30 pm Keynote speaker: Tawanna Black, President and Owner of Innovations by Design. Tickets: Summit and Luncheon $75, Luncheon only $50. To register or to get more information visit ncbwomaha.org or call Glenisha Nelson 402-819-7810. Urban League of Nebraska presents Equal Opportunity Day Luncheon Hilton Omaha, 1001 Cass Street 11:30 a.m. - 1:00 p.m. Keynote speaker: Derrick Hill, Field Vice President, Cox Business. Tickets: $75 Contact: 402-453-9730 or urbanleagueneb.org. Empowerment Network presents… 3rd Annual Christmas in the Village at 24th and Lake Noon – 6 pm Open to the community. Come join us for a holiday tradition and celebration! Indoor and Outdoor activities for children, adults and families. For more information, visit empoweromaha.com. In 1931, songstress Belle Baker sang a song, the title of which was “All of Me.” It was a song of a jilted lover asking the question of her ex as to why he did not just take all of her since he had already stolen her heart. Recorded by many African American artists, such as Billie Holiday, Louis Armstrong, Pearl Bailey, Ella Fitzgerald, Count Basie, Duke Ellington and a host of others, the central question — why not take all of me? — strikes a chord into the hearts of those who have experienced this situation as well. REVIVE! Revive! Business Networking Luncheon for African-American Business Owners and Entrepreneurs The Fourth Friday of Every Month 11:30 am - 1:00pm Networking, guest speakers, special presentations and business opportunities. Lunch available for purchase. Contact us at info@reviveomaha.com or 402-490-1542 for more information or visit facebook.com/ReviveOmahaMagazine. get “rusty.” This truth is not simply applicable in regard to academia. This truth proves itself with regard to our spiritual mindsets as well. going through, we are unaware of the answer because we have failed to engage ourselves in spiritual things. We are rusty. Many of us are spiritually “rusty” because we are unfortunately lazy when it comes to engaging ourselves in spiritual things. We are selective about when we want to be spiritual. We want to experience God’s presence only when we are going through something. We want to get into God’s word only when rough times shake us up enough where we desire to hear a word tailored for us. We engage ourselves in church and church activities when we believe it is a good way to earn particular blessings from the Lord that we have been desiring. The Bible tells us to be ready in season and out of season. If I can put this in modern day vernacular, we have to be educated when school is in session and when school is out of session. We can’t just be Sunday morning believers. We can’t just be Wednesday Night believers. We can’t just be “when times are rough” believers. We have to be believers in season and out of season. This requires us to be in God’s word, be in God’s presence, engage in Godly activities, and function in God’s purpose at any given moment. Don’t get caught being a rusty believer. Now is your opportunity for refreshing. Just like the individual who returns to college after years out of school, refreshing is possible and is worthwhile. The end result is desirable. Let’s be refreshed in our spiritual minds! Dr. Chang and her husband, Galen Anding, own Anding Family Dental in Omaha.  hat options do I have to pay for W my treatment plan? Dental insurance works differently than medical, but is a financial benefit toward your treatment. Also, there are other options, such as Care Credit, and our new option for the uninsuredAnding Advantage Dental Discount Program. This is designed to help our new and existing patients pay for their preventive, restorative, and cosmetic care. Is it important to be seen every six months at the dentist for a cleaning and exam? Yes, absolutely! Why? Firstly, it is a preventive time for oral cancer screenings, early cavity detection, and for those who are diabetic or have heart disease. It helps to keep gum disease and bone loss from arising. Secondly, it is more cost efficient for the patient and the dentist. Is it going to hurt? Dentistry has come a long way in the last generation. We do well in offering pain free treatments to all our patients. We use new techniques, including oral sedation that is highly effective in dealing with high anxiety patients, and a gentle hand always helps. procedure coverage. We, as a courtesy, file your insurance; however, it is to your benefit to know, read, and understand the specifics of your plan. They are all different and can change year to year, and vary from employer to employer. What if I donâ&#x20AC;&#x2122;t like my smile? If your gums and teeth are healthy, we have found Invisalign to be a great option for older teens and adults. Invisalign is a nice alternative for straightening your teeth without brackets. Invisalign is perfect for our adult patients who are ready to do something to pamper themselves. With Invisalign, daily care of your teeth is much easier than with traditional braces. listened to her? Would she have been heard? Would more people know who she was and what she stood for? Being able to verbally express ourselves is an important part of communicating with others. It helps others understand our perspective. Many of us may never be paid public speakers, however it is important to be comfortable and showcase the ability to speak publicly whether in our jobs, schools or church. We must also educate our children on the importance of speech. We don’t know what the future holds for our children and exposure to public speaking at any age prepares them for tomorrow. Whether it is speaking in a board room or addressing our country, we want our children to be prepared. The following are tips that can help prepare our children for public speaking. Read: Reading helps to expand our vocabulary. If there are words in which you do not know the meaning of, look it up in the dictionary. The dictionary will give the definition and correct pronunciation of the word. Recite: Reciting words aloud will help you be able to enunciate the words correctly. This can be done by reading books and magazines out loud. One technique I used when I was younger was to read aloud the information that is scrolled across the television screen during the news or weather alert. Observe: Observing others can be beneficial to learning to speak clearly. For instance, watching and hearing how the news anchors and reporters announce the news can help us enunciate our words. Recording: Videotaping ourselves or audibly recording our speech can also help us know what we need to work on. Oftentimes, our voices sound muffled when recorded. Therefore, we can identify what sounds and words we specifically need to practice pronouncing clearly. If we want to be heard, we must know what to say and how to speak what we are saying. As the old E. F. Hutton commercials used to say, “When E.F. Hutton talks, people listen”. Choose smoke-free housing. It’s the only effective way to avoid the dangers of secondhand smoke. Find available smoke-free housing at RentSmokeFree-Tenants.org This project is supported in part by Region 6 Behavioral Healthcare through funding provided by the Nebraska Department of Health and Human Services/Tobacco Free Nebraska Program as a result of the Tobacco Master Settlement Agreement. If you notice these signs, please consult with your physician for an evaluation. Being aware of the warning signs helps you to be proactive about health, early diagnosis, and treatment. Let’s focus on health and the health of our family so that we can reach our purpose. 25% discount for Members and Groups of 6 or more! 2014 and do not have an exemption, you will face a penalty when filing your personal 2014 tax return. The penalty will initially be small, but will grow significantly over the next several years. • Online Insurance Marketplace: Beginning January 1, 2014, you can now shop for insurance online, or through a licensed broker to advise you on subsidies and coverage. It will not cost you more to use a licensed broker. • Enroll Now: Open enrollment or the ability to enroll in health insurance as an individual or small business begins October 1, 2013 for a 2014 effective date • Dependents Covered to Age 26: The Act requires plans and issuers to offer dependent coverage until the child reaches the age of 26. Both married and unmarried children may qualify. • Pay or Play: By 2015, companies with more than 50 full time employees will have to offer affordable and minimum essential coverage to full time employees or pay a penalty. They have to offer dependent coverage as well, although there is no affordable requirement. There is no mandate to offer coverage to spouses at this time. • Insurance Company Overhead Limited: The law says that carriers must spend at least 80% (85% for large employer groups) of premiums collected on medical care or improvements. No more than 15-20% for overhead and profits to the health insurance company. • Navigators: The federal government has provided funding for navigators to help consumers understand and navigate the online health insurance system and provide information on subsidies and other options available. • Essential Benefits Package: There is now a standard for a minimum level of coverage that must be offered, known as essential benefits. • Medicaid Expansion: The state of Nebraska did not expand Medicaid. This still leaves a gap of low income individuals who may not qualify for Medicaid or a Federal subsidy, but if the cost of insurance is above the percentage required by law, those individuals will not be penalized. Questions: Does the ACA cover illegal or undocumented residents in the United States? No. The law does not allow for federal subsidies or credits for individuals that are not legally present in the United States. Are there any exemptions to the mandate for Individuals to purchase health insurance? Yes. You can apply for religious exemptions. Also, those not legally present in the United States or incarcerated are exempt. What are other exemptions? • Those who cannot afford coverage based on formulas within the law • Have income below the federal income tax filing threshold • Are members of a recognized Native American tribe • Uninsured for gaps of 3 months or less • Received a hardship waiver or are outside the United States How do I satisfy the Mandate? Purchase coverage through the Nebraska exchange, your employer, Medicaid or state assistance program such as Children’s Health Insurance Program (CHIP) or Senior Health Insurance Information Program (SHIP). What if I need help? Contact a licensed broker, community navigator or call a government hotline (1-800-318-2596). You can also visit www.healthcare.gov. from other cities have been traveling to Omaha to learn more about the Empowerment Network Collaboration. Representatives from Des Moines, Minneapolis, Kansas City, St. Louis, Atlanta, Chicago, Los Angeles, Boston, and Cleveland have already visited, and additional cities including Birmingham, Baltimore, Quad-Cities and others are bringing groups to Omaha. “While many cities are facing similar issues, this group has focused on solutions and is making measurable progress by aligning efforts and organizations,” said Cartwright.“In most communities, we can’t get organizations to work together and here Omaha has seven years of research and development that shows that it is possible. Every city in America needs to implement this approach.” The Empowerment Network’s background, vision, mission, goals and 7 Step Empowerment Plan are included in the NAREB State of Housing in Black America report that is being distributed nationally and also shared with elected officials, including the Congressional Black Caucus and White House. Recently, the Network also partnered with the City of Omaha and was one of eleven cities selected to receive technical assistance from the National League of Cities to develop a comprehensive plan to improve outcomes in the area of employment, education, housing and health for AfricanAmerican men. Network members have also participated in planning meetings with the African-American Leadership Forum which included representatives from Minneapolis, Tacoma, Seattle, Portland, Des Moines and other participating cities, Pittsburgh and Philadelphia. What kind of tomorrow do we want for the region? KICK OFF! Doors open at 5:30 p.m. with programming from 6–8:30 p.m. Food and drinks provided to attendees. For more information, visit Heartland2050.org or call 402–444-6866. SEE PROFILE ON PAGE 25. $75 per person. Tables of 10 and various sponsorship levels are also available. For more information or to purchase tickets, call 402-453-9730 or by Lovely Nai Photography visitPhotos www.urbanleagueneb.org. Recognizing omahaâ&#x20AC;&#x2122;s african american corporate and business executives When African-American leaders are celebrated and recognized in Omaha, one category typically gets overlooked. Behind the scenes are influential African-American business leaders working in powerful corporate positions. A few of the executives have been recognized in national publications and by international groups for their ability to generate positive results for their company, but most people in the community wouldnâ&#x20AC;&#x2122;t know them if they walked by them on the street. Most of them actively serve on non-profit boards and work in their church or community organizations on a consistent basis. Some of them manage departments and divisions responsible for hundreds of millions of dollars and, in a few cases, billions are under their purchasing control, sales or financial responsibility. Revive! Omaha Magazine is excited to present twelve of our most dynamic and influential African-American corporate business executives and leaders. We celebrate their personal and professional successes. In a city where African-Americans are not well represented in the boardroom and corporate suites, we thank them for stepping into leadership roles and setting the bar high for future generations. Just as importantly, we thank those who are using their time, strengths and influence to make a positive impact in the community and serve as mentors, sponsors and champions for the next generation. In future editions, we will feature even more of these inspiring corporate leaders. Their stories must be told and celebrated. Recognized by Black Enterprises as one of corporate America’s Most Powerful Executives. Eric Butler was named Executive Vice President - Marketing and Sales for Union Pacific in 2012. In his position, Butler is responsible for Union Pacific’s six major business units: agriculture, automobiles, chemicals, energy, industrial products and intermodal. Collectively, the business units account for nearly $19 billion in annual revenue. He also oversees the railroad’s National Customer Service Center. Eric has been with Union Pacific for 28 years and formerly held the position of VPFinance (Planning & Analysis) as well as positions in the Accounting, Operations Analysis, and Human Resources Departments. Eric received a Bachelor of Science degree in Mechanical Engineering in 1981 and an MSIA in 1986, both from Carnegie Mellon University in Pittsburgh, PA. Eric is a recipient of the Durham Western Heritage Museum African-American Heritage Award for business. He is a member of the Executive Leadership Council and sits on the Boards of the Tepper School Alumni Board, National Association of Manufacturers and Omaha Airport Authority. Eric is an ordained minister serving at the Joy of Life Ministries in Omaha. He and his wife, Cynthia, have three children. Aileen Warren joined First Data Corporation in 1997. She has worked for the company for over 16 years, where she has been promoted several times to her current role as Vice President of Human Resources. Warren has over 25 years of Human Resources experience including work in the areas of employee relations, training and development, recruitment, hiring, performance and talent management, mergers and acquisitions, and diversity. From 1989 -1996, she served as corporate trainer for First National Bank of Omaha. Aileen graduated from the University of Nebraska at Omaha with a Master of Social Work Degree in 1985 and a Bachelor of Social Work Degree in 1983. She has served on various community boards including Boys and Girls Club of the Midlands, American Red Cross, Inroads, Family Services, and Girls, Inc. For her commitment to youth, she has received the Boys and Girls Club of America National Service to Youth Award and The Boys and Girls Club of the Midlands Woman and Youth Award. She was also recently named an Omaha North High 2012 Viking of Distinction. Aileen is married to Thomas Warren, Sr and they have three children. Rob Trebilcock joined Blue Cross Blue Shield in 2007 and has served in various leadership roles. In his current role, Trebilcock focuses much of his time on collaborating with Nebraska nonprofit organizations that are seeking opportunities to support their mission. Prior to joining Blue Cross Blue Shield, Trebilcock worked at Convergys Corp. in customer service and financial services, managing business in Canada, India and the United States. Born and raised in Canada, Rob came to the U.S. on an athletic scholarship and played collegiate football for four years. He has spent many hours volunteering in the community and coaching a variety of sports. He’s been a mentor in the TeamMates program and has been a member of the men’s advisory council for the Institute for Career Advancement Needs, or ICAN. Rob currently serves on the boards of the Nebraska Sports Council, Youth Emergency Services and Charles Drew Foundation. Rob has two children -- daughter Payton and son Tre’. Recently named by Black Enterprise magazine as one of the nation’s Top Diversity Executives. Angela Jones sits on the ConAgra Foods senior HR leadership team with current responsibility for both company culture and Diversity & Inclusion. She previously led the talent management team in addition to leading transformational human capital initiatives across the company. Prior to joining ConAgra Foods, Angela held Director of Operations and Plant General Manager positions for The Clorox Company as well as significant operations roles at Procter & Gamble. Angela holds a bachelor’s degree in chemical engineering and an MBA from Georgia Tech. She is currently working on her dissertation in behavioral ethics and expects to earn a Doctorate in Business from Georgia State University in 2014. Very active in her community, Angela sits on the boards of ICAN, Heartland Workforce Solutions, University Nebraska – Lincoln Department of Management, Charles Drew Foundation and the Empowerment Network. On the national level, she sits on the board of the Global Women’s Leadership Forum and the National Council of La Raza (NCLR) President’s Council. Angela is a single mother of 16 year old twins, Tia and Cory. Chandra Henley is responsible for fitness, duty determinations, the field occupational health nursing program, disability prevention/management for injured or ill employees, medical surveillance, 1,600 company sponsored fitness facilities, health risk reduction programs and UP’s national award winning health promotions. Prior to her current appointment, Chandra led numerous processes in UP’s Finance Department for 25 years. Henley holds a bachelor’s degree in Accounting from Drake University, a Certified Public Accountants’ certificate and a Masters of Business Administration from Northwestern University. Henley currently participates as an active member of the American Heart Association Board, the Salem Baptist Church Trustee Ministry, the newly developed African American Professional Network Advisory Committee and other efforts. She is also a Chamber of Commerce Leadership Omaha graduate. Chandra has fraternal twin sons, Brandon and Austin. Ernest White has been Vice President and Commercial Lender for American National Bank at the 31st & Ames location since May 1995. Ernest joined American National Bank in 1983 and prior to his current position, he served as Branch Manager for their 144th & Q Street branch. In his previous position, Ernest was responsible for the day to day operations of a $35 million asset branch, while focusing on commercial lending, including installment, home equity and consumer loans. He now focuses on small business lending and community reinvestment working out of the 90th & Dodge and 31 & Ames Street locations Originally from New York City, NY, White received his Bachelor of Science Degree and Masters Degree from Penn State University in State College, PA. He is active in the Omaha community and is also a member of the Omega Psi Phi Fraternity. Clarence Nichols serves as Sr. Vice President in Commercial Banking at UMB Bank. He has more than 20 years of experience in the banking industry and has originated more than $300 million in lending activity. Clarence is active in the community as he currently serves as the Chairman of the Board of Directors for Community Health Charities. He is also a member of the Board of Omaha Healthy Kids Alliance (OHKA), the Salvation Army and a Trustee for the Salem Baptist Church. Clarence has a Bachelor of Science Degree from the University of Bellevue and is a graduate of the Colorado Graduate School of Banking at the University of Boulder. He is also a graduate of Leadership Omaha and a recognized performer at the American Institute of Banking Schools of Banking. Clarence is married to the former Laurie D. Kempkes: together, they have three children, Savannah, Jalen and Colin. Dana Washington oversees and directs all phases of business and insurance litigation filed by or against the Mutual of Omaha throughout 17 states and all phases of employment-related litigation throughout the country. She is responsible for providing ongoing advice and counsel to numerous corporate business areas with a particular emphasis on claims/customer service and human resources. In addition, she serves as the corporate sponsor of Mutual of Omaha’s Black Employee Resource Group (BERG). Prior to her role at Mutual of Omaha, Washington clerked for the Honorable Joseph Bataillon of the United States District Court for the District of Nebraska, practiced insurance defense litigation as a trial attorney with the law firm of Wickman and Washington. Washington obtained both her undergraduate degree and juris doctorate from the Creighton University Law School. Washington is a member of the Nebraska Bar Association and the Midlands Bar Association. She currently serves on the Board of Directors of the Mutual of Omaha Foundation and Big Brothers Big Sisters of the Midlands. Dana is married to Darryl Washington and has three children. Lisa Laday-Davis currently holds the position of President for the Davis Insurance Agency and owner of DavTech Risk Solutions, Inc. The companies are niche insurance placement and risk solutions agencies specializing in public entities and nonprofit corporations. The companies currently manage over $10 Million in insurance premium placements. Laday-Davis manages the Agencies top 10 Public Entity, Educational Institution and Social Service accounts and she provides consulting and risk solutions. Laday-Davis began her career as Financial Analyst with First Data Investor Services Group. She gained her experience as a CPA by working as an In-charge Accountant with Hayes & Associates and Schwarz & Associates. Laday-Davis graduated from Louisiana State University in 1995 with a Bachelor of Science in Accounting. She possess licenses and certifications in the areas of finance and accounting, risk management and insurance placement. She obtained her Certified Public Accountants license in 1999. President, Davis Companies Owner, DavTech Risk Solutions, Inc.
Laday-Davis has worked with various community and nonprofit organizations in Omaha. She is currently the Board President of the Independent Insurance Agents of Nebraska representing over a 1,000 independent licensed agents across the state of Nebraska. Mary Mudd, Realtor® (402) 697-6844 • Fax: (402) 980-4987 mary.mudd@cbshome.com MaryMudd.cbshome.com I can help you to BUY, BUILD or SELL your HOME or RELOCATE anywhere in the United States. Carl M. Christian (402) 689-9453 • (402) 731-5008 cchristian@npdodge.com npdodge.com/CarlChristian I’m never too busy for your referrals. Worthy Dental Dr. Justin Jones, General Dentist (402) 571-7200 6530 Sorenson Parkway • Omaha worthy-dental.com Open Monday - Friday Emergency appointments available and walk-ins welcome. A family-oriented practice. We value your smile! Anding Family Dental • Michelle Chang, D.D.S. (402) 933-4632 • andingfamilydental.com 4702 Lafayette Street • Omaha View testimonials at www.demandforce.com/b/afdental. 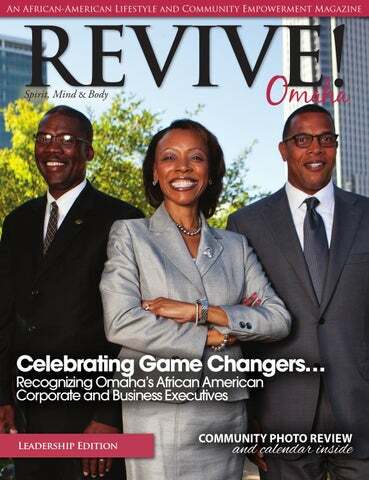 Directory To advertise, call: 402-490-1542 or email: info@reviveomaha.com. For subscription information, please visit reviveomaha.com. In The Masters Hands Beauty Salon (402) 991-4160 7810 Dodge Street • Omaha Tuesday-Friday 10am-6pm Saturday by appointment only. 3020 Huntington Avenue • Omaha Open 24 Hours • Ages 6 weeks - 14 years old Biblical and Educational Teachings Transportation provided. To make an appointment, call (402) 991-4160. The First Annual African-American Business and Community Directory You still have time to reserve your space!!! The Directory will feature profiles on businesses and organizations, calendar of significant events and venues, photos, a comprehensive listing of businesses, community groups, churches and more. Please contact us at 402-490-1542 or info@reviveomaha.com to reserve your space. To advertise, call: 402-490-1542 or email: info@reviveomaha.com. 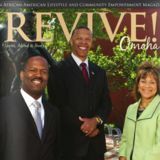 For subscription information, please visit reviveomaha.com. 4th Annual Striving for Success: African-American Male Summit One example of a specific strategy focused on the success of African-American male students is the Striving for Success: African-American Male Summit, hosted by the 100 Black Men, Urban League of Nebraska and Empowerment Network. The 4th annual event consisted of a full day of presentations, dialogue, Q & A sessions, role modeling and mentoring, and a keynote speaker. This yearâ&#x20AC;&#x2122;s event was held on September 10, 2013 at the Metropolitan Community College Culinary Institute, and featured Josh Jones, former Central High and Creighton University student athlete. Over 140 African-American 9th grade young men and 40 African-American men from a wide array of careers and vocations participated in one of the groupâ&#x20AC;&#x2122;s largest events. Many of the men made formal commitments to stay involved throughout the year, and follow up events and activities are in development. The participants thanked the presenters for providing an inspirational and life changing day of activities. For more information, call (402) 502-5153 or visit EmpowerOmaha.com Open to the community. Tells us about your vision for I AM Dance? What advice do you have for individuals who have aspirations to start a business? We offer all forms of Ballet, Tap, Jazz, Tap, Hip Hop and Cheer/Pom from Beginner to Advanced. We have a competition team who will be competing both regionally and nationally. What types of classes are offered at I AM Dance? What type of dance background do you bring to your studio? I have been a student of dance for 35 years. I knew at an early age I wanted to dance when the movie,“Fame,” came out, and at that moment I knew I had to be CoCo. I have been afforded the opportunity to travel the country and islands where I got to take workshops with some wonderful choreographers and teachers. I have performed at the world famous Apollo Theatre, Caesar’s Palace and locally at the Omaha Community Playhouse, just to name a few. I have participated and taught at various dance workshops across the country as an independent contractor. In the past, I have choreographed for several schools, churches, studios and community organizations. Currently, I am choreographing and assistant producing “ANNIE the Musical” 41˚10'0"N with the John Beasley Theater at The Scottish Rites, October 4-6, 2013. This will be the second play the John Beasley Theater and I have collaborated on—the first being “The Wiz” at The Rose Theater. I AM is not only an acronym, but a homage to the great I AM who gave me the vision and ability (Exodus 3:14). I AM (Interdisciplinary Arts Movement) Dance’s mission is to empower all youth to achieve their artistic potential and to foster an appreciation of the Performing Arts through an arts education program. I want our young boys and girls to shine and have the proper skill set needed should they decide to further their dance career. I AM will raise the level of dance in our community. I want our youth to know the history of dance and be properly trained. DOCSIS 3.0 modem required. Cox cannot guarantee uninterrupted or error-free Internet service or the speed of your service. Actual speeds may vary. Services not available in all areas. Other restrictions apply. © 2013 Cox Communications, Inc. All rights reserved.